Wamgroup proudly introduces their new outdoor Test Plant in Ponte Motta, Modena (Italy) including a comprehensive webcam monitoring system. The Test Plant includes most Wamgroup products which are integrated in a system that allows simulation of real operating conditions. The system is connected to software which controls, detects and registers performance data of all the equipment (silo demo centre). To enable Wamgroup subsidiaries from all over the world to carry out remote tests, a webcam monitoring system has been installed. Uncompromising dedication to R&D is the foundation of a vast product range and the development of market-oriented equipment made up from standardised modular components. This is the foundation of Wamgroup‘s success. Testing of prototypes and innovative concepts. 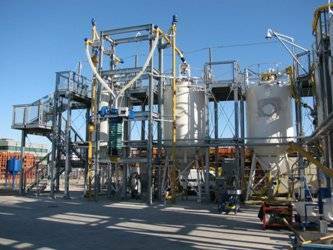 Wamgroup firmly believes that this Test Plant is also an outstandingly innovative sales and marketing tool. At the beginning of the 3rd millennium Wamgroup stands for particularly market-oriented structures and maximum synergies between the Group’s members. Thanks to the webcam monitoring system and the testing software, the Wamgroup sales and marketing team is now able to show the Group’s products in action everywhere any time. Training on product installation and maintenance.